Travellers! There’s some good news for you. 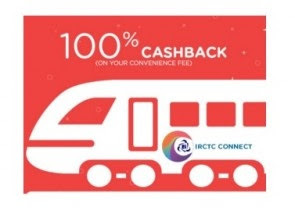 In a bid to encourage digitization and promote cashless transaction, the Indian Railway Catering and Tourism Corporation (IRCTC) has started a lottery system where you can get 100 percent cash back. The IRCTC has reportedly taken the decision to encourage digitization and promote cashless transaction. • As per reports, passengers need to purchase rail tickets on IRCTC’s official website and make the payment through their BHIM (Bharat Interface for Money) app or UPI (Unified Payment Interface). • Passengers have to opt for one of the two apps. • Every month five persons will be chosen through a random lottery and would get 100 percent cashback. • Winners would be individually contacted by phone and email. It is expected that the move will boost Prime Minister Narendra Modi’s dream of a digital India. Besides, with the initiation of this scheme, people would be more encouraged to buy tickets online and there will be less crowd at ticket counters. Earlier, IRCTC had been giving free travel insurance for passengers who had confirmed tickets. Besides this, the Railways had expanded its SMS alerts for departure delays of over an hour to more than 1,000 trains, including premium and super-fast express trains. This scheme of Indian Railways will continue till March 2018, it was launched last year.